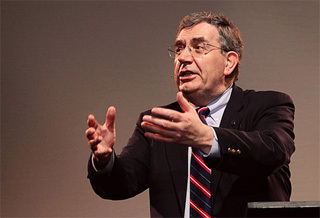 Dr. Sinclair Ferguson is a pastor, professor of systematic theology, and Ligonier Ministries Teaching Fellow. He is also a member of the Council of the Alliance of Confessing Evangelicals, a prolific author whose many books include By Grace Alone, and one of the most renowned Reformed theologians of our day. While the churches of the historic Reformed tradition that have been given so much have often sold their birthright, God has been raising up a new generation of young men and women who want to be serious students of Scripture, who want to learn to pray, to build strong families and solid churches, and to work the gospel into their everyday lives at home and in the workplace. Fifty years ago looking for the Reformed faith could be like trying to find a needle in a haystack. It was preserved in a few rather small denominations. Now it is possible to find biblical ministries in all kinds of churches and denominations (think of the diverse church affiliations of the speakers at Ligonier this year). There are untold riches in Reformed literature, too much for any of us to read in an entire lifetime! There are magazines like Tabletalk as well as others… Then there are many conferences, like this one, attended by large numbers of hungry young people. A Reformed conference of the variety, size and scope of the Ligonier National Conference would have been unimaginable in the years immediately following the Second World War. But here we are! Very aware to whom he will be speaking, Dr. Ferguson’s message at our 2012 National Conference is sure to encourage and stretch all of us. Here’s a preview of what to expect in Orlando this March. Even among those who hold to the basic truths of the Christian gospel, there is a tendency to remain content with milk and never strive to dig into the meat of the Word. Doctrinal shallowness is endemic and accepted. In this message, Sinclair Ferguson encourages us all to wrestle with the deep things of God and to stretch ourselves by reading some of the great theologians of the past. On March 15-17, 2012, we invite you to come and hear R.C. Sproul at our 2012 National Conference, “The Christian Mind.” It will be an edifying time of fellowship and teaching together, helping prepare you to think like a Christian in an anti-Christian culture. In June last year, Chris Larson sat down with Dr. Ferguson to discuss a variety of topics, including mentoring and leadership, corporate worship, the “new calvinism”, and sanctification.